Here is a bit of sponged and stamped nail art. I created the sponged design using three of the Sally Hansen Lustre Shine polishes and China Glaze Want My Bawdy. 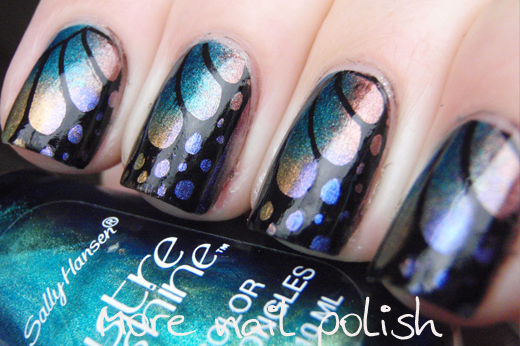 Rather than creating a gradient down the nail, I created a four way quadrant sponged design. I like how this gave the wings a different look compared to a normal gradient. The stamping plate that I used was the Vivid Lacquer plate VL004, but I believe this image is available on other brand plates too. I also used my new sticker XL stamper that I got from Messy Mansion. I'm going to have to a bit of a tutorial on it, because it's totally changed the way I stamp. I'm finally able to stamp designs on my nail lined up correctly, and its all because of that extra squishy, sticky stamper. 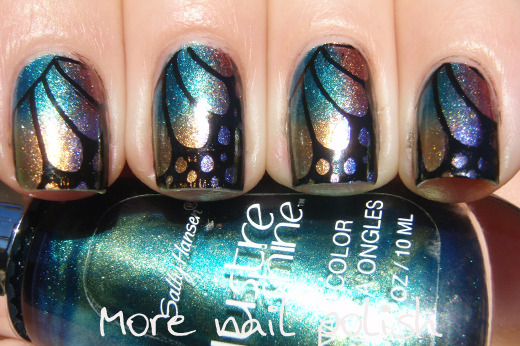 This was such a beautiful mani and I received so many comments about it. People thought I painted the black wing lines free hand, and they also had no idea how I got the multicoloured background! I've been really lemming the two Chanel shades Azure and Bel-Argus. 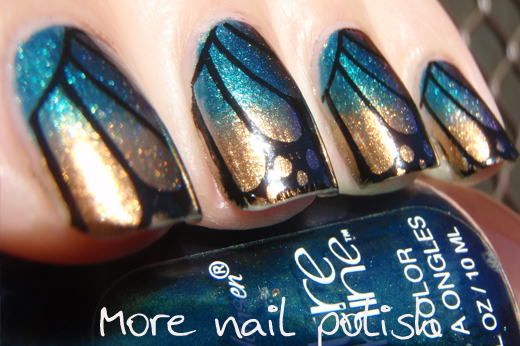 I would have loved to create this butterfly wing mani using polishes from the L'Ete Papillon de Chanel (The Summer Butterfly) collection, but I don't think my budget can stretch to those two polishes and will just have to make do with these Sally Hansens and the China Glaze Bohemians. 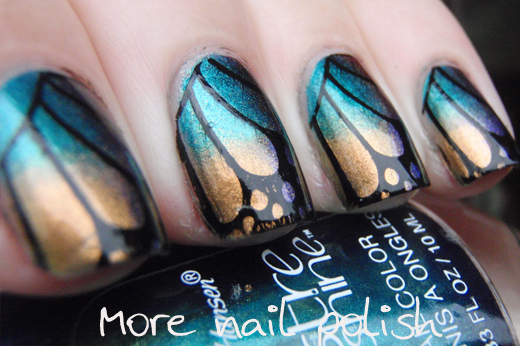 That really is a lovely style of doing a gradient! Ooooh Pretty! I love this. Okay so I had to pin this so I could do it later. 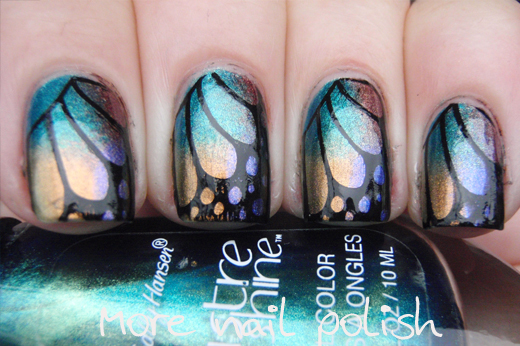 I have several of those Lustre Shine polishes and never use them. I don't like a plain single polish mani and this is the perfect way to use them all! I am going to check out that squishy stamper and I forgot Messy Mansion had some cute stamping plates I wanted too. Beautiful! You really do need Bel-Argus! It's pricy, but worth it. I felt the same way, but am glad I broke down. It's beautiful! Azure lemming was satisfied by other blue/green duos, as it was not unique, as is B-A. What a gorgeous design! I may have to invest in that stamper - it sounds like it could be the answer to all my stamping fails! Perfect! Only thing I would have done differently, is adding white to the open dots.